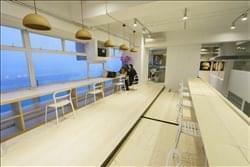 Find My Workspace lists over 95% of the serviced offices & coworking space market in Chai Wan. Simply click Request Quote to check pricing for one office, or Add to Basket for multiple offices. This center provides affordable coworking space, great for entrepreneurs or freelancers. The space offers 24 hour access to members so that you can work around the clock, when business is best for you. There is a free Wi-Fi connection throughout the space and a private bathroom is also provided. A 3,500 sq. ft. creative co-working studio for makers. A maker is anyone who creates, this can range from a woodworker to illustrator to website designer. With the help of their staff, technicians and with multiple workshops and open studio areas you can bring your ideas to life. When you need to time to relax, the office has a kitchen, balcony and sea views. The center offers private office, hot working and fixed desk solutions which cater to fashion, design and media professionals over three floors. There is a range of facilities, such as a fully equipped photo, kitchen, and recording studio, and a purpose-built catwalk to name a few. The space features large, open, well-designed workspaces and cozy breakout areas. To obtain information for your selected Chai Wan Serviced Offices & Coworking Space, please tick the "Add to basket" box for each office you prefer and complete the form below. We will then send a detailed report via email.